"Beware, funny game" is written in large letters on the PsychoPet-gamebox, and what do you expect from a game that claims too be funny? Indeed, the graphic design and the story of the game seem to fit exactly to this statement. Especially the comical doctor figures of the players and the dog bowls that are used as game pieces on the board let you expect a fast and amusing game. But can the gameplay come up to these expectations? Christian Fiore and Knut Happel have proven that they are able to create this kind of games, since their earlier works like Saba or Pecunia non olet show a well-found balance between an ingenious gameplay and a somewhat funny story. 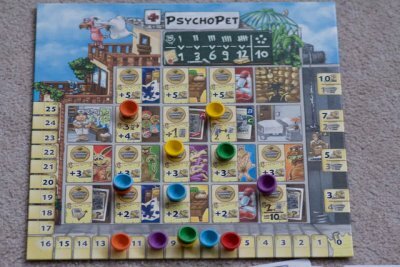 In PsychoPet the players fill the role of veterinary surgeons. They work in a clinic for mentally disturbed pets and try to heal the patients by applying different therapies. In the first phase therapy cards are laid out one by one on the table. All cards should be ranged in a row, so that every player can see them. The cards show various therapies. After each card that is laid out all players decide whether they want to put their doctor next to the fresh uncovered card or whether they want to wait for the next therapy card. This goes on until all players have placed their doctors next to the cards or a therapy is uncovered for the second time (uncovering the same card). Then a chaos breaks out and it is no longer possible to place one´s doctor. Hard luck for those guys, because the number of cards laid out before the card where one´s doctor stands are the possible therapy points a player gets for this round. The therapy points can be altered by improvements a player can research in the clinic, of which I will tell you a bit more later on. If a player has enough points to heal one of the five patients from the display, he can do so in the following phase. The player immediately gains as many victory points as he had therapy points to spent. However, as there are five different kinds of patients which can be healed, it also becomes important to collect (heal) pets of the same colour because this increases a players haul of victory points in the final scoring. Therapy points can also be used to place the dog bowls in the various rooms of the clinic. Every room either improves the result of a specific kind of therapy card from the previous phase (e.g. a player gets two or three instead of one therapy point for the therapy "Pills"). Or the room gives the player a different benefit, for example to get action cards cheaper. 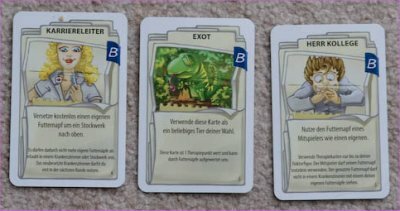 Action cards are the last option to spend one´s therapy points. They give the players bonuses, too, for example additional therapy points for a healing or instant victory points. The game ends when only one kind of patient is left to be healed. As indicated, a final evaluation is made on the basis of the number of patients a player has healed of the same kind. A special bonus also is given for those doctors who have managed to heal five pets of different kinds, because this is considered as an exceptional talent. So far, so good. The rules are simple even though the rulebook is a little bit confusing at the beginning. The gameplay works rather straightforward and will be understood by smaller children, too. They will love the crazy pets on the cards, placing the dog bowls in the clinic and sending their doctors to the therapies. All the same, for me something seems to be missing, because the right feeling did not come up in my testing groups. I don´t exactly know what it is, but I did not really feel filling the role of the doctors. That it is a pity, because GOLDSIEBER has given the game some excellent equipment. The game pieces are well modelled and lovingly painted, and the board has a very good artwork. So everything is prepared to create the atmosphere you should get when playing a game called "funny". I suppose that the reason for this somewhat negative feeling is that the game lasts longer than it is good for it. The rules are just too simple to justify a game duration of 45 minutes or longer. You surely will be faster after the one or other game, but what is that good for, if your first game does not wet your appetite? 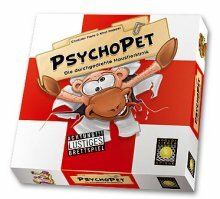 Thus, if you do not expect to be the game to be as hilarious as the title suggests, PsychoPet will do a satisfactory job as a family game. But to be honest, a round with more experienced gamers which is looking for a lightweight diversion usually will be attracted by other titles.